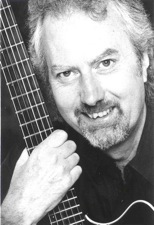 Oliver Whitehead was born in Oxford, England, and now lives in London, Ontario, Canada, where he has taught at the University of Western Ontario since 1978 as well as composing and performing as a guitarist. His compositions include an Oratorio, We Shall Be Changed; a world-music Mass, The Mass for All Creatures, Concertos for Oboe and Cello; a Suite for wind quintet; and extensive music for TV, Ballet and Theatre. 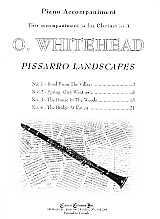 Most of his compositions have been recorded (Pissarro Landscapes was recorded in 2007 and is on the CD The Nightingale’s Rhapsody, Cambria, LC 5882). French Impressionist painter Camille Pissarro was born on July 10, 1830 in St. Thomas, Danish West Indies and died on November 13, 1903 in Paris, France. Of his more than 1600 works, the overwhelming majority are landscapes. 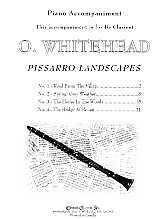 Whitehead was initially inspired by two of Pissarro’s works at the Art Gallery of Ontario, being particularly attracted to a quality of atmosphere in these landscapes which seemed possible also to convey in musical terms. 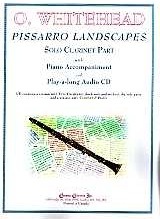 Pissarro Landscapes was composed in 2000 as a combined commission from two amateur orchestras, one Canadian and one international (Canada and United States), which shared the same conductor, who also happened to be a Clarinetist and professor at the Faculty of Music at the University of Western Ontario.